New parts for old bindings are hard to find. Used parts for old bindings should now become easier. Trade in your used and/or broken Dynafit bindings for store credit, and we will make the working parts available for others. Please note these parts come with absolutely no warranty. We do a reasonable eyeball inspection of the parts, but can in no way guarantee their integrity. If you are not comfortable taking risks with used parts, please purchase a new part, toe, heel, or complete binding instead. For information on trading in your alpine touring binding, see our current policy on binding recycling. Below is a list of some the parts we have accumulated. Speed Rad Heel Base - Adjustment mechanism w/ heel post. Often the older model with a brass pin for anti-rotation. Speed Rad Heel Housing - A full heel piece except for the base plate. SpeedFit Toe & Heel Pieces - Full toe or heel with all mounting plates and hardware included. Radical Roof - Black top with risers for Speed, ST, FT. Radical Roof Screws - The little Torx screws that hold the lid on. Radical Heel Pins - Pin with plastic spacer they pass through. Radical ST/FT Toe Piece - Whole toe unit. No baseplate or screws. Radical ST Toe Plate - Plastic lifters under the ST toe pieces. Radical Crampon Receptors - Bent metal pieces that hold crampons. Radical ST Heel Baseplate - Original ST baseplate that had removeable brakes. No brakes included but Vertical ones will work. Radical ST Brakes - Original style brakes that require the "H" clip brake retainer. Retainer not included. Vertical ST/FT Toe Piece - Complete toe piece for the old ST or FT (as listed), with baseplate. Vertical ST/FT Toe Plate - Plastic baseplate that goes underneath the toe pieces. Includes integrated metal crampon receptor. Vertical ST/FT Heel Piece - Brakeless heel piece for the Vertical ST or FT (as listed), including base plate. These are sometimes white and sometimes brown. Brakes sold separately. Vertical Brake - Brakes that work with either Vertical model and likely the Comfort series. Vertical Brake Retainer - Retainer "H" clip that holds Vertical, Comfort, and first-gen Radical brakes onto the heel piece. TLT Speed Heels - Just the housing & lateral springs, not the baseplates. Available with standard riser or a B&D Speed top plate (roof). Nubbins optional. Tri-Step Toe Piece- Tri-Step toe piece, complete with baseplate. Tri-Step Heel Piece- Complete heel piece for Comfort or Tri-Step binding, including baseplate. Tri-Step Heel Housing- Just the plastic body of the heel piece for a Tri-Step. Tri-Step Volcano- Red volcano riser for the Tri-Step binding. Works for Comfort series as well. Thimble Bushing - Bushing that holds the lateral springs against Vertical or Radical heel towers. Adjustment Screw - Grey lateral release screw. Light Lateral Springs - For bindings up to RV 10 (Speed Rad, STs). Both inner and outer springs for one heel. I searched through prior questions in an attempt to avoid asking my own, apologies if it is a duplicate. Was looking at a friend's Radical binding, and it looks like the same roof screw pattern as my Speed Turn 2.0s. Could I swap roofs for flip levers if I came across a spare Radical roof? Hi Conor, unfortunately that doesn't really work as the base tower detents are different and you'll have the heels spin on you. You could use a Maruelli anti-twist to counter that though. Oh, interesting, didn't think swapping roofs would have such an effect. Thanks for the quick feedback! I have TLT Vertical FT12 bindings (white) with broken top heel riser. I see you have a vertical ST heel piece listed. Does this part include the top heel riser? Do you guys have a picture of what is included with the Speed Radical heel housing you have listed in your spare used parts list? Hi Patrick, we occasionally see them but none in our box right now. They are included with new Vertical brake kits, however. Spare toe lever for dynafit superlite. If you don't have one, any advise? 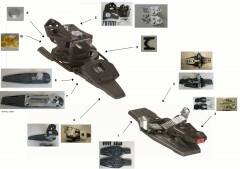 Hi Jesse, we have new replacements currently available in our Dynafit Binding Parts. They are listed as LTR 2.0 / Superlite 2.0 Toe Lever. Hey Lucas! Sure does! It's white! Does the used Radical ST 100mm brake you have listed include the baseplate for a TLT Radical 1.0? Hey Steve! The brakes and baseplates are integrated into one another so yes, it'll include the baseplate! Hey Joseph! We don't have any used heel plates, although we do have some new heel plates in stock! Find them here. Hi Matt, unfortunately we do not have any in stock and haven't seen any for some time. Keep an eye on the listing because if we get some we are sure to put them up on here! diameter and thread count it is? Hey Jared, we have a couple options available, shoot me a quick email at help@skimo.co! Hello, I need a replacement heel piece for a dynafit FT binding. Is the "Radical FT Heel x1 $65" all that I need to order? Hey Tyson! Yup, that should do it! I have a broken Dynafit Radical ST 1.0 version heel. Which one is compatible? I guess the Radical ST heel at $55, right? Hi Adrian, yes, that is correct. Greetings, i contacted dynafit about a new pin/arm on my TLT ST Vertical 12 binding and they referred me to you. Is this a part you can replace? are there other parts from other bindings that i can drop in place that will work? As you can see in the pic the pin has sheared off from its home in the arm. Dang Brady! Bummer! Unfortunately replacement wings are rarely a solution and you're looking at replacing the toe piece entirely. Looks like we're out of toes right now so if you're in a pinch, the Plum Guide or Race toes would drop into that hole pattern, as would the Kreuzspitze or even a number of other toe piece options. We can also set it up to alert you when we receive used toes in stock. Do you have or know where i could get two vertical toe plates? My old ones cracked and need some replacing. Hey Matthew! I don't have any vertical toe plates at the moment, so just by default the best way to get some new plates would be to get a new toe piece, unfortunately. Hi Matthew, we did get some new Vertical toe plates in stock here. I have an older pair of the dynafit vertical 12 bindings and the heel piece no longer stays in the climbing position well when I'm sidehilling (after a few steps it rotates back to the no rise position). I put a friends older heels pieces on and it seemed to fix the problem, but I need to return those. I think this is pretty common problem with those bindings but am not sure what I need to repair the problem. Is it just a new spring and/or the white plastic cylinder that the spring pushes into the base plate post - or do I need a whole new heel piece or??? and of course do you have anything in stock that will fix the issue. Hey Jason! There are a ton of factors at play here. 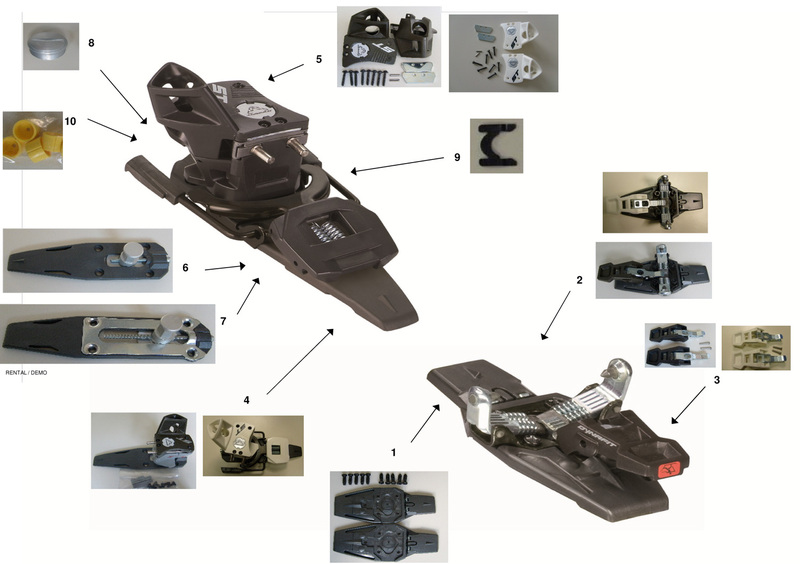 Based on the picture, it looks like the entire heel piece, both baseplate and housing, came off your ski. Did you end up dropping their heel pieces into your ski, or did you just swap heel housings?Were your friends using brakes or were theirs brakeless as well? Did you use the same release value when your friends heel pieces were installed as your existing heel pieces were using? Feel free to send me an email and we can get to the bottom of it. Thanks for the response. I only put the picture up to show which binding I had - Nothing came off the ski until I took it off. I just swapped the heel pieces, which fixed the problem. I had (and still have) brakes on the skis. My friends heel piece only had a din of 10, so it was a slightly lower setting (I had mine maxed at 12). Does the Vertical brakes 92mm include a brake retainer? I need to replace both on my bindings. Hi Bob, only the new kits include the retainer. I'm looking for Dynafit TLT Speed (2011) heel housing (without the base). Since there is no offer at the moment, I'm wondering if I could use Speed Radical Heel housing instead? If not, I would buy the whole heel: does Radical ST Heel include the base? Hey Casper! Unfortunately the tower diameter is going to make that really tough. The TLT Speed has a shorter tower that's smaller in diameter, whereas the newer Radical series bindings have a taller/thicker tower so I don't think it's going to work. That being said, the good news is that the hole pattern for most of Dynafit's heels hasn't changed in years so you could probably buy the complete Speed Radical heel here and drop it into the existing holes. Obviously, you'll want to consult our hole pattern article first before deciding this. Hi Anita, those are out of production. Your best bet is a B&D comfort plate + volcano. I would need a pair of heel raisers (part 5), and one H-clip (part 9) for Verticals. Do you have any? The text is not visible anymore, so I don't know if the bindings are FT or ST. Unfortunately, we don't have either part in at the moment. Hi Henrik, please note you can use the B&D comfort plate and volcano to replace the riser mechanism.